We recently had a very successful visit from Branko Popovic and Nawie Kuiper from FASHIONCLASH. FASHIONCLASH is an international and interdisciplinary fashion platform based in The Netherlands, with a main focus on new generation of designers. Main goal of FASHIONCLASH is to connect talent, various disciplines, cultures and reach a broad audience through the art of fashion. FASHIONCLASH provides the platform by developing and organizing projects where young designers / artists can show their work. 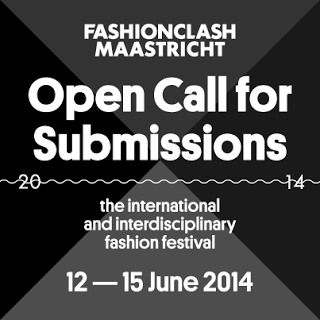 FASHIONCLASH are currently looking for submissions from final year students and graduates. This is a fantastic opportunity to have your work seen on an international stage and to meet graduates and young designers/artists with similar goals and ambitions. The FASHIONCLASH blog posted an article on their visit to the college. Work above by Sarah Ryan - 2013 Graduate - among many who were featured.